Neutrophil membrane-coated nanoparticles present a broad-spectrum anti-inflammatory strategy for rheumatoid arthritis management. The paper in Nature Nanotechnology is here. 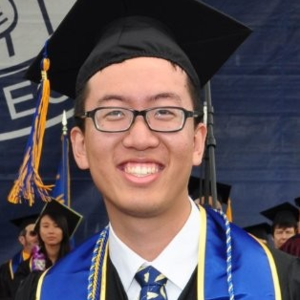 Five years ago, I was an undergraduate student at the University of California San Diego (UCSD). To me, designing novel biomaterials to solve medical problems is always an intriguing topic filled with wonders and excitement. One day, I read a paper published in Nature Nanotechnology about making nanoparticles by wrapping synthetic polymeric cores with membranes of natural cells to detain bacterial toxins1. I was intrigued by the elegant assembly of natural and synthetic materials for therapeutic functions that otherwise did not exist. I was also excited to see that the invention was from my own university. I wrote a letter to Professor Liangfang Zhang in the NanoEngineering Department at UCSD, the senior author of the paper, and expressed my eager of participating in his research. He accepted my application. Five years have passed since then and I am now pursuing my graduate degree under his supervision. Since the start of my research with Dr. Zhang, I have been involved in several projects aimed at developing cell membrane-coated nanoparticles. Membrane coating presents a facile top-down method to directly replicate the highly complex functionalities of the natural cell membrane. The resulting nanoparticles therefore mimic some of the properties of the source cells, from which the membrane is derived. This design marries the advantages of natural cell membrane and synthetic nanomaterials for novel biofunctions. For example, I witnessed the development of platelet membrane-coated nanoparticles that effectively targeted damaged vasculatures and platelet-adhering pathogens2. These targeted nanoparticles efficiently delivered therapeutic payload in the polymeric core to the disease site, demonstrating unique platelet-like functions bestowed by membrane coating. I also participated in the development of macrophage membrane-coated nanoparticles for sepsis management3. Leveraging macrophage membrane receptors responsible for the sensing of bacteria-derived endotoxins, we engineered macrophage membrane-coated nanoparticles to sequester endotoxin and dampen the propagation of sepsis. In the past a few years, I have witnessed the emergence of cell membrane coating as a platform technology in the fields of nanomaterials and nanomedicine. 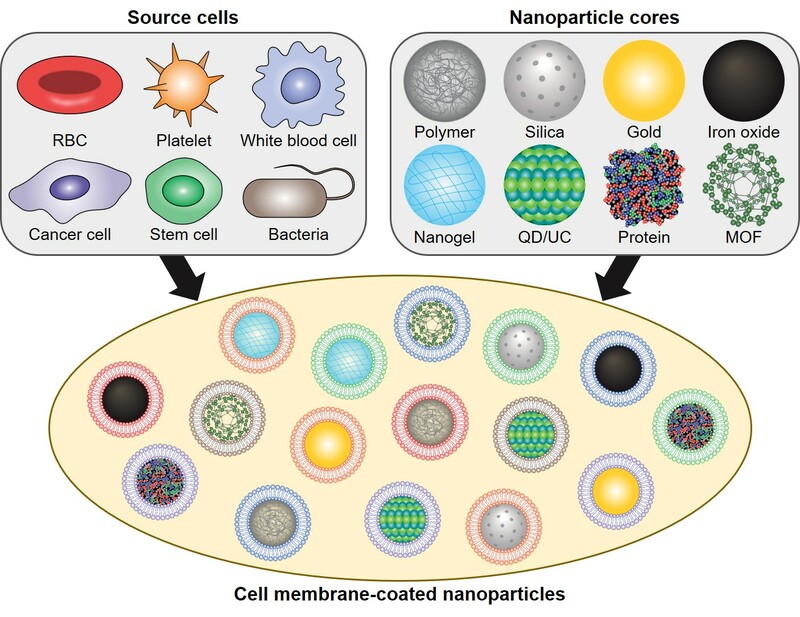 Cell membrane from a variety of cell types have been used to coat over nanoparticles made from many different materials4 (Figure 1). Figure 1. Design concept of cell membrane-coated nanoparticles. A variety of cell types have been used as sources of membranes to coat over nanoparticles. Each cell membrane type can utilize unique properties to provide functionalities to nanoparticulate cores, the material of which can be varied depending on the desired application. Figure adapted from reference 4. Rheumatoid arthritis came to my attention during my discussion with Dr. Zhang. It was a devastating disease. The specific cause of rheumatoid arthritis is unknown and the disease is incurable. Progress has been made in rheumatoid arthritis treatment, especially the use of biologics that inhibit tumor necrosis factor alpha (TNF-α) and interleukin (IL)-15. However, existing approaches still carry considerable limitations. Today, rheumatoid arthritis affects more than 1.3 million Americans and about 1% of the worldwide population6. Unmet needs in treating rheumatoid arthritis has prompted the development of nanoparticles to seek leaky vasculatures at inflamed joints7 or inflammatory cells8 for better delivery of anti-inflammatory drugs. It also inspired the use of natural microvesicles from neutrophils, which presented pro-resolving protein Annexin A1 to protect joints in arthritis9. I was excited to read about these novel approaches and their remarkable engineering ingenuity. Dr. Zhang encouraged me to read more about rheumatoid arthritis. I learned that in rheumatoid arthritis, neutrophils play crucial roles in disease progression. As the “first-responders” to inflammation, neutrophils arrive early at the inflamed joint in response to inflammatory cytokines and chemokines. They relay and amplify inflammatory signal to various immune cells downstream10. The active roles of neutrophils intrigued the idea of developing nanoparticles coated with neutrophil membranes (neutrophil-NPs), which may serve as targets of signaling molecules but without propagating signals. Could this be a broad-spectrum anti-inflammatory agent and a solution to rheumatoid arthritis treatment? I decided to find out. The major challenge I encountered early in this project was developing a reliable and reproducible neutrophil production process. Unlike many cell types that could be expanded in culture, the most reliable source of neutrophils is freshly collected blood11. Furthermore, neutrophils are known to undergo apoptosis rapidly after isolation12. My only option was to repeatedly collect and isolate neutrophils for membrane derivation. It then became challenging to control the quality of different neutrophil batches. To tackle this problem, I carefully optimized and streamlined the entire neutrophil collection process, from technical parameters such as route and time of neutrophil activation, to operational parameters such as isolation procedures, the total time needed to complete them, and even the personnel performing the procedures. The quality of different neutrophil batches was further analyzed using a variety of parameters to ensure consistency of the resultant neutrophil membrane. Looking back, this well-designed neutrophil production process bestowed the neutrophil-NP platform with excellent reliability. The hard work of making neutrophil-NPs paid off. I was excited to see neutrophil-NPs showed remarkable efficacy to inhibit arthritis damages when injected locally to the joints. The swelling of knee joint and cartilage damage were both significantly alleviated with neutrophil-NP treatment. In addition, early treatment using neutrophil-NPs showed profound systemic anti-inflammatory activity. We were also excited to observe that the therapeutic efficacy of neutrophil-NPs was comparable to that of anti-cytokine antibodies similar to what are used in rheumatoid arthritis therapies13 (Figure 2). Figure 2. a, Schematic representation of neutrophil-NPs designed for suppressing synovial inflammation and ameliorating joint destruction in inflammatory arthritis. b, Change of hind knee diameter on day 60 compared to that of day 0 in a therapeutic study with CIA mouse model. c,d, Representative images of H&E staining (c) and safranin-O staining (d) on knee sections from mice treated with neutrophil-NP, PBS, anti-IL-1β antibody or anti-TNF-α antibody. Scale bars, 100 μm. F, synovial membrane fibrillation; H, synovium hyperplasia; I, immune cell infiltration. Figure adapted from our paper13. SpringerNature. The use of neutrophil-NPs as a potential treatment for rheumatoid arthritis is still an early stage technology and only tested with experimental arthritis in mice. Tremendous challenges exist prior to employing this strategy for anti-inflammatory therapy. For example, large-scale manufacturing of neutrophil-NPs may be challenging with the use of natural cell membrane. In this respect, bioprocesses for ex vivo production of neutrophils have reached a clinical scale and may help to produce a large quantity of neutrophil membranes14. Meanwhile, significant progress has been made in producing human cells with universal immune compatibility15, which would also enable cell supply for clinical studies. These technological advances together offer a promising prospect for the translation of neutrophil-NPs. Seeing these progresses also motivates me to pursue more ideas and overcome more medical challenges with cell membrane coating technology. Our paper: Zhang, Q. et al. 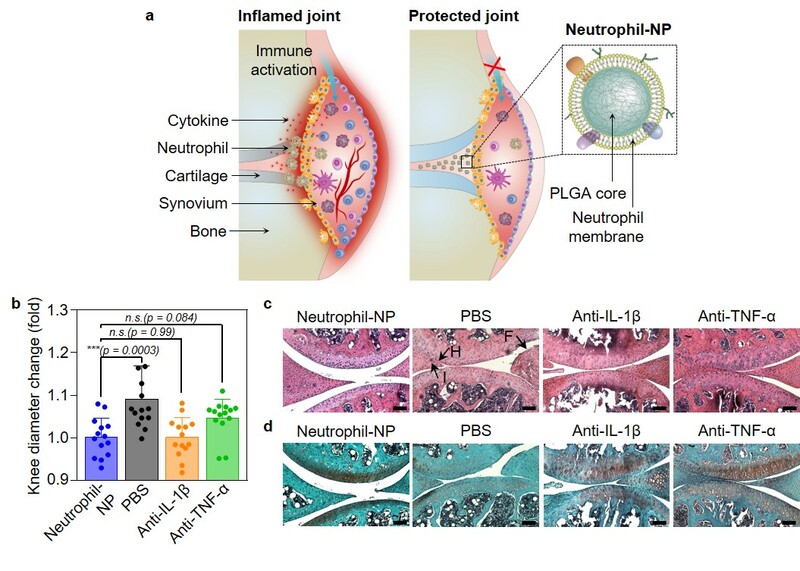 Neutrophil membrane-coated nanoparticles inhibit synovial inflammation and alleviate joint damage in inflammatory arthritis. Nature Nanotechnology (2018). A News & Views article from Nature Nanotechnology: Neutrophil wrap. 1. Hu, C.-M. J., Fang, R. H., Copp, J., Luk, B. T. & Zhang, L. A biomimetic nanosponge that absorbs pore-forming toxins. Nat. Nanotechnol. 8, 336–340 (2013). 2. Hu, C.-M. J. et al. Nanoparticle biointerfacing by platelet membrane cloaking. Nature 526, 118–121 (2015). 3. Thamphiwatana, S. et al. Macrophage-like nanoparticles concurrently absorbing endotoxins and proinflammatory cytokines for sepsis management. Proc. Natl. Acad. Sci. 114, 11488–11493 (2017). 4. Fang, R. H., Kroll, A. V., Gao, W. & Zhang, L. Cell Membrane Coating Nanotechnology. Adv. Mater. 30, 1706759 (2018). 5. Chan, A. C. & Carter, P. J. Therapeutic antibodies for autoimmunity and inflammation. Nat. Rev. Immunol. 10, 301–316 (2010). 6. Taylor, P. C., Moore, A., Vasilescu, R., Alvir, J. & Tarallo, M. A structured literature review of the burden of illness and unmet needs in patients with rheumatoid arthritis: a current perspective. Rheumatol. Int. 36, 685–695 (2016). 7. Hofkens, W. et al. Safety of glucocorticoids can be improved by lower yet still effective dosages of liposomal steroid formulations in murine antigen-induced arthritis: Comparison of prednisolone with budesonide. Int. J. Pharm. 416, 493–498 (2011). 8. Thomas, T. P. et al. Folate-targeted nanoparticles show efficacy in the treatment of inflammatory arthritis. Arthritis Rheum. 63, 2671–2680 (2011). 9. Headland, S. E. et al. Neutrophil-derived microvesicles enter cartilage and protect the joint in inflammatory arthritis. Sci. Transl. Med. 7, 315ra190-315ra190 (2015). 10. Wright, H. L., Moots, R. J. & Edwards, S. W. The multifactorial role of neutrophils in rheumatoid arthritis. Nat. Rev. Rheumatol. 10, 593–601 (2014). 11. Ferrante, A. & Thong, Y. H. Optimal conditions for simultaneous purification of mononuclear and polymorphonuclear leucocytes from human blood by the hypaque-ficoll method. J. Immunol. Methods 36, 109–117 (1980). 12. Edwards, S. W., Derouet, M., Howse, M. & Moots, R. J. Regulation of neutrophil apoptosis by Mcl-1. Biochem. Soc. Trans. 32, 489–492 (2004). 13. Zhang, Q. Neutrophil membrane-coated nanoparticles inhibit synovial inflammation and alleviate joint damage in inflammatory arthritis. Nat. Nanotechnol. (2018). 14. Jie, Z. et al. Large-scale ex vivo generation of human neutrophils from cord blood CD34+ cells. PLOS ONE 12, e0180832 (2017). 15. Feng, Q. et al. Scalable Generation of Universal Platelets from Human Induced Pluripotent Stem Cells. Stem Cell Rep. 3, 817–831 (2014).